The 186 BR (bowrider), brand new for 2010, is also Rinker Boat Company’s newest and now smallest value-priced offering looking to attract new customers into boating, but contains all of the necessary essentials for boating enjoyment. It is one of twelve completely new models introduced by Rinker over the past three years. The 186 BR is also one of fourteen models in Rinker’s four series of sportboats (Captiva Bowriders and Cuddies, Flotilla Deckboats, plus the MTX Series) from over eighteen to almost thirty-one feet in length. 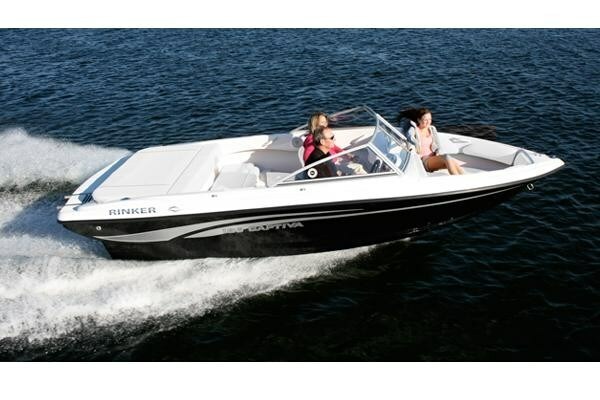 Rinker also offers six express cruiser models from almost twenty-nine to over forty-one feet in length. The 186 BR is available with three choices of solid hull and bottom colours: white, red, or black, each with standard hull graphics with “Designer Touch” and tape accenting. It has a full fibreglass cockpit liner for strength and easy maintenance, stainless steel cleats, an integrated, molded swim platform with telescoping, 3-step, stainless steel boarding ladder plus a stainless steel, transom-mounted ski-tow eye, all to enhance your choice of watersport fun. A large aft sunpad leads to a clean, roomy cockpit with a full-width rear “sport” bench seat with storage under. More storage large enough for skis or wakeboards is found in the cockpit floor. Bucket seats accommodate the driver and passenger and more storage is found in the portside glove box. All vinyl upholstery is GX48 treated with stain, mildew, and microbial resistance. The helm is outfitted with “Turned Titanium” dash and helm accents, backlit Faria® gauges with jeweled faces and stainless steel bezels, a 12-volt DC outlet, power steering with a sport wheel design, and a molded footrest for the driver. A premium AM/FM/CD stereo with MP3/iPod® auxiliary input is standard along with a portside dash-mounted stereo control with LCD digital display. A curved, tinted, safety-glass windshield with opening centre section leads to the bow area featuring full U-shaped seating with padded backrests throughout and storage under the seat cushions. Most notable options include a color-coordinated acrylic bimini top with boot, bow and cockpit covers, snap-in cockpit carpeting, and a stainless steel propeller.